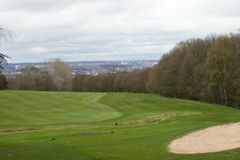 South Leeds is a fantastic choice for golfers predominantly for two reasons: the first is its proximity to the city, a mere ten minute drive from the centre, and the second is the tremendous golf course, founded originally in 1906 and redesigned by the great Alister Mackenzie in 1923. Dr Mackenzie is renowned for creating some of golf's most exquisite courses, with Augusta National heading a monumental list of worldwide gems, and the time he spent in the Leeds area will be appreciated by any South Leeds visitors. Ideal for low and high handicappers alike, South Leeds is a welcoming club whose course is known for its excellent putting surfaces. The greens are small and undulating, part of a thoroughly enjoyable course for anyone including South Leeds in their golf tour.